As anyone who has been to New York City knows, it can be overwhelming, but there is no shortage of good food and drink. In fact, there are often more choices than you get your head around for good restaurants, cafés, bars, brunch eateries, coffee shops, or street food. The same goes for tea. Anyone desiring a good tea experience will not be disappointed, and the fact that there are so many options makes for a refreshing change; us tea drinkers are used to having to seek tea spots out, sometimes going considerably out of our way. Additionally, there is huge variety in the type of tea experiences on offer in New York City—perfect for some like me who enjoys all different tea traditions, or for anyone who suffers from a split personali-tea. The following two experiences, which occurred on consecutive days, are a good example of the variety on offer. On one of my first days in the city I discovered “Franchia”, a vegan café that has been reviewed on this blog before. This was an East Asian tea experience through and through; although they do not explicitly market themselves as Korean (they just say “vegan café), they serve traditional Korean teas and food. They serve their loose leaf teas in a gaiwan or kyusu, and also offer traditionally prepared Korean herbal infusions such as Date Paste Tea and Korean Plum Tea. These are options you would rarely, if ever, encounter outside an establishment that serves Korean tea, and added uniqueness to this experience. The following day saw a tea experience that was in stark contrast: I had tea English-style at “tbsp”, a brunch café picked out by my dining companions. The tea itself was not what stuck with me (Mighty Leaf, so excellent for bagged tea and still tasty, but nothing special). Rather, what stuck with me were their tea wares. 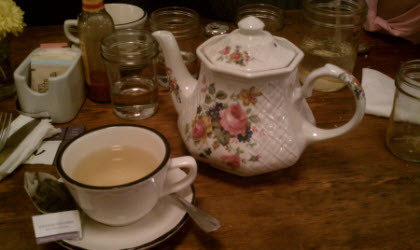 They had an eclectic collection of English-style teapots that looked like they had been found in various antique shops. They were all lined up on the counter as if on display on someone’s mantle, or even in a museum. Each order of tea was served in one of these interesting teapots, which were so sizable that even I was impressed (the smallness of restaurant tea pots is one of my most common complaints). When I ordered a second tea, it came in a different tea pot, giving me a chance to use and admire another specimen from their collection. It was an element that made the event memorable as a tea experience, rather than just being another cup of tea along the way. So, rather than be overwhelmed by what New York City has to offer, give thanks to the gods of metropolitan density for being able to find unusual and delicious tea places without the usual hassle. For those who can’t commit to just one tea style, you can enjoy the profusion and variety of tea experiences to be had. If you are the kind of person who prefers only one type of tea experience, you can have fun trying out all the different tea establishments of that type! Something for everyone. How Many Different Teas Can You Name? Truly I love all the post that you have written. Thanks, Nitsolem- hope you continue to enjoy them!